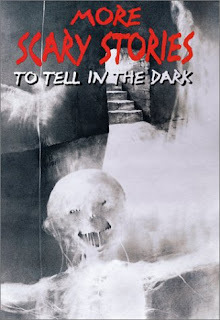 I've been sicker than a dog all weekend, and for some reason in my mind that meant - read as many scary stories as you can! Nothing like being scared out of your wits with a runny nose and cough. I now know that just increases their effect. 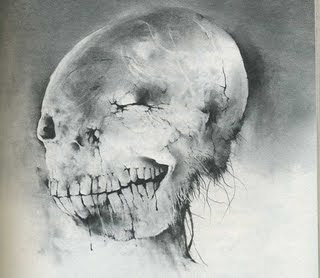 More Scary Stories to Tell in the Dark was a great place to start. Collected from folklore and retold my Alvin Schwartz, these stories are short and to the point, thereby bypassing a common error with these types of books - I wasn't bored to tears by the length and bad writing. These are supposed to be written for a younger audience (it says on the back for ages 9 & up) but I would think twice before letting someone that young read them. Not unless you want to be up with them in the night! 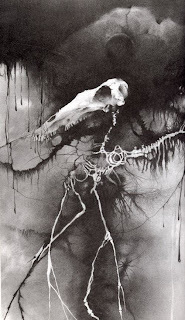 Illustrated by Stephen Gammell, these drawings are horrifying! It's not that hard to imagine someone screaming. 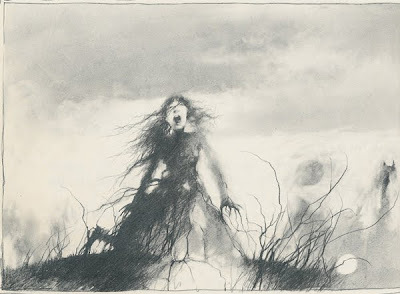 These pictures would give my eleven-year-old nightmares. They'd give my fifteen-year-old nightmares! They gave me nightmares! 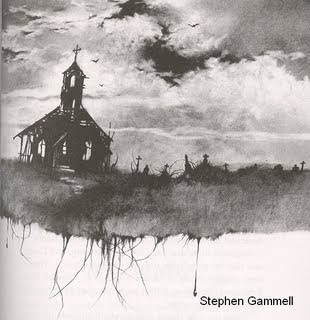 So, in other words, if you like a scary short story, I highly recommend this collection. Read it on Halloween for maximum effect though, or better yet, give it to an arch enemy as a birthday gift. Trust me, you won't regret it...wink,wink. Well, you're a good mother then, because my mother, she let us read them! What was she thinking?? You're boys are tough. I tried to read one to my son last night, and he's like - No thanks mom. And here I am lapping it up. there's something impressive about a well-told scary story. it's best when it isn't luridly gory - just suggestive of impending mayhem. I can't handle these books and never could. Hamilcar - that's just how I'd describe these. Just enough to inch in your craw and make you nervous or uncomfortable. Anything more would be too much. Rebecca - Thanks! I have the cold from heck. I wouldn't wish this on anybody. Maybe sometime before the end of time it will go away! Yeah, I think you should steer clear of these. And then I was going to add, maybe I'd make a good MIL gift?? Huh? ?